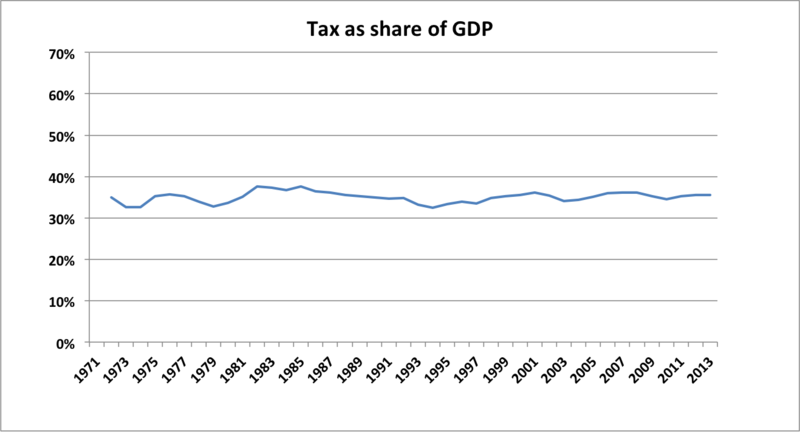 But tax as a percentage of GDP has been really quite stable, especially over the last thirty years or so. This is not a picture of taxes that ‘keep going up’. Rather more interestingly, Tim says that the state’s demand for tax forces people into work with undesirable social consequences, asserting “Battles over social policy are still in their infancy. No one, for example, cares as much as for children as their own parents but the contemporary state seeks to tax families so much that they have no choice but to work all hours that God sends”. Now this isn’t perhaps the place to dwell on the fact that Universal Credit was the idea of the Centre for Social Justice of which Tim was a founder, and that one of its givens is that everyone should work and work as much as possible, largely for normative social policy reasons which are nothing to do with tax bills. Tim alarmingly implies a state continually trying to force through tax rises on a reluctant population. But the main reason that taxes can’t “keep going up” is that in fact they haven’t been going up – certainly not on the % of GDP basis that Tim quotes. And in the one year it “got up” to 37.6% this was 1984/85 when the percentage increased not because taxes rose but because GDP fell. But we’ve seen that the tax burden as a percentage of GDP hasn’t really gone up at all, so how is the need to pay these taxes forcing more and more people to work more and more? Looking at the share of GDP that goes to people in earnings, over the same lengthy time period, this is really quite stable too. It’s lower now than in the 1970s but hasn’t changed very much over the past thirty years. 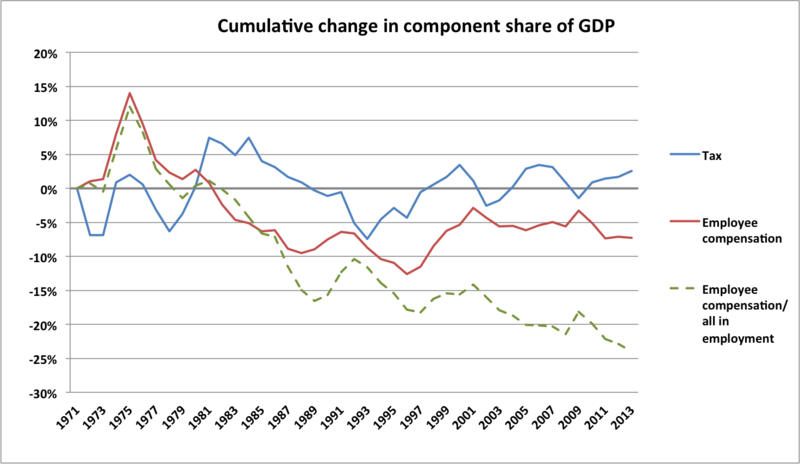 So if neither the share of GDP going to people in earnings nor the share required of them in tax are changing much, how are kids losing out on billions of hours of family time? · ‘per person’ compensation has gone down by nearly a quarter. So if there has been any ‘forcing’ into employment, it has been caused by a smaller proportion of what individuals produce being given back to them in earnings. 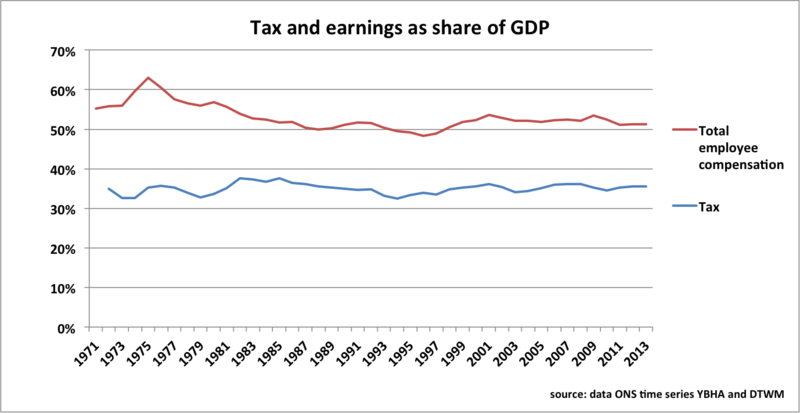 Meaning more having to work to maintain the same share of GDP in earnings. Now some distortion is possible because not all workers are employees, but the data don’t distinguish between employees and self-employed over quite as long a time period. Making the same calculation and comparisons using numbers only of employees is possible since 1984 and the picture is very similar. 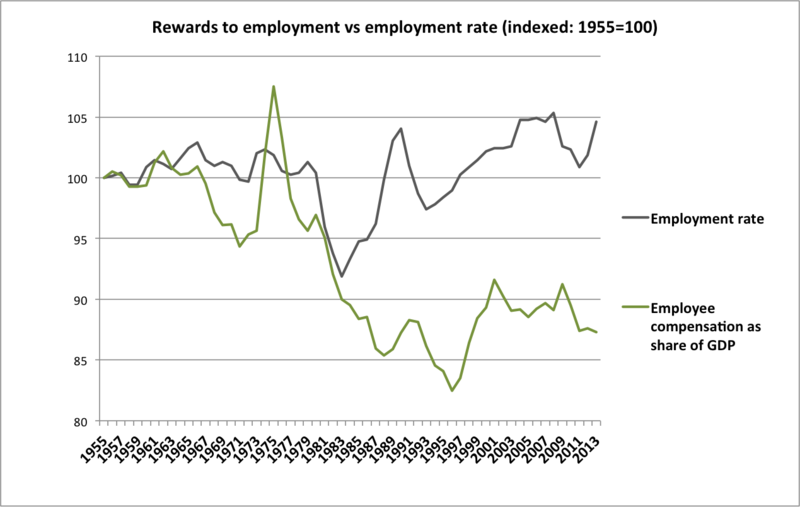 Remember that the apparent spikes up in employee compensation are not signs of greater earnings, but drops in GDP. So the overall trend is of each employee getting less as a share of GDP and this trend long predates the much-headlined ‘unprecedented drop in real earnings’ over the last few years. 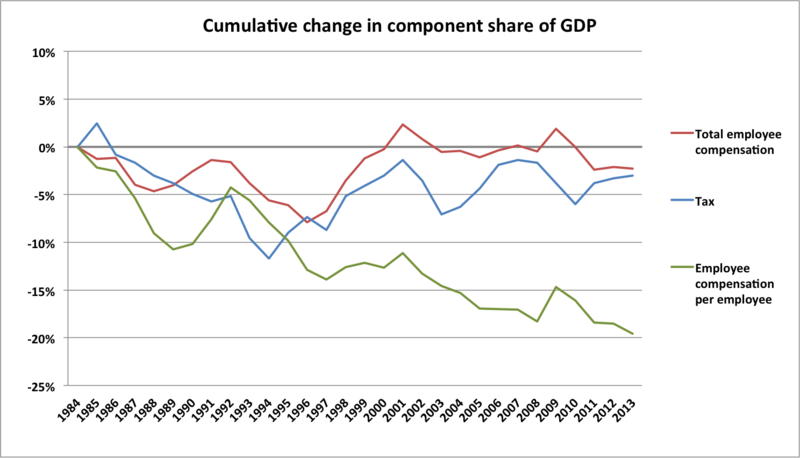 The close correlation between tax as a percentage of GDP and total employee compensation as a share of GDP does not suggest an increasing tax burden at all. And of course if there are in fact increasing numbers in work sharing that burden, the logical conclusion is that they are each paying less. So it is hard to see any reason at all to conclude that higher taxation is requiring people to leave their kids for work. Rather it is that work is providing less and less for more and more. Writing in Financial World, Jonathan puzzles over the lack of productivity rebound from recession, and wonders whether ground has been lost permanently here. There are five key drivers of increases in UK self-employment. Overall these suggest the growth derives from weakness in the economy and is a sign of slack. Their report should download here.